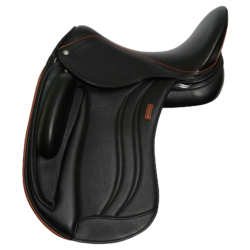 In collaboration with the renowned International Grand Prix rider and FEI 5* judge Anne Gribbons, we have created another exquisite dressage saddle as part of our industry changing Bi-NateLine. The Let’s Dance by Anne Gribbons combines stunning craftsmanship with extreme comfort and performance for both horse and rider. The Let’s Dance by Anne Gribbons features our deepest close contact seat yet and our innovative NW-Twist. This provides the rider with an extremely narrow twist for ultimate contact with the horse all while simultaneously providing the horse with a wide twist to ensure maximum weight distribution and freedom of movement. Our innovative shoulder relief and shook absorbing tree points, with the cut-back panel provides the best shoulder freedom in the industry and our adjustable Lightweight-3D AdapTree® can be adjusted on an ongoing basis to your horse and to any future horse(s). As part of the Bi-Nate Line, the Let’s Dance by Anne Gribbons comes standard with our revolutionary PSI panel system to maximize the saddle’s weight bearing surface area throughout the length of the panel with the lowest pressure per square inch of any English saddle. Have the dance of your life with your horse in the “Let’s Dance”. Anne says, “The right partner makes all the difference. That’s why I chose Schleese for performance, comfort and fit.” Check out this link to see Anne dancing with Jochen to introduce the “Prancing with the Stars” Fundraiser a couple of years ago in Wellington – this truly was a match made in dancing heaven! Jochen Schleese got his certification as Master Saddler at the age of 22 and came to Canada in 1986 to establish and register the trade of saddlery in North America. With over 80 different models designed over the years, Schleese Saddlery Service Ltd is the world leading manufacturer of saddles designed for women, specializing in the unique anatomical requirements of female riders. Schleese authorized representatives provide diagnostic saddle fit analysis and saddle fitting services across the globe to maintain optimal saddle fit to horse and rider. Jochen is the author of the best-selling “Suffering in Silence: The Saddle Fit Link to Physical and Psychological Trauma in Horses”, now in its third printing by Trafalgar Square and available in hard copy, digital, paperback and soon audio versions at amazon.com. He and his company have been the recipients of numerous business and industry awards over the years and have been featured in the Wall Street Journal as well as twice on the Discovery Channel. He is a regular guest lecturer at various equine and veterinary colleges around North America and Europe. A couple of years ago, a friend offered to let me ride her mare. She rides in a Schleese saddle. From the moment I sat in her beautiful saddle, I knew that I had to have one for myself. A Schleese saddle then became my dream saddle. I finally found THE ONE after a year and a half. I dabble in dressage as a hobby but do not currently compete. I also participate in mounted archery with my horse Reagan. Yes, you read that right, I shoot bows and arrows off of the back of a horse. A lot like the Native Americans used to do on the American Plains - except that I ride in a Schleese Wave. I love my saddle so much as does my horse. From the first ride wearing it, he moved out so freely. It was almost like riding a completely different horse. His trot became less choppy and restrictive. He is also more willing to pick up the canter for me without tossing his head. I feel that he is able to extend his shoulder without the saddle tree jamming into his shoulder blade. This is something I never realized was a common issue with other saddle trees on the market today. Because of our Schleese saddle, when we head down the lane to shoot, I can feel nearly every muscle of his back and am able to connect with my horse. We are able to move together as a unit. It takes an enormous amount of trust for me to drop the reins entirely and trust my horse to run steady while I shoot. In turn, he trusts me to use equipment that is comfortable to him in order to allow him to do his job effectively. I feel that it helps him to enjoy his work and build a positive relationship between not only he and I but also between himself and his “work.” I adore the quality craftsmanship of my Schleese. I know that it is well made and will last us for many years to come. I have five saddles in my tack room and my Wave is now the ONLY saddle that I use. I can ride for hours in my Schleese and don’t get sore. Thank you so much for making a top of the line product that is multi-faceted to fit my varied riding styles. Reagan appreciates your fabulous products too as we have the 8” anatomical girth and stirrup leathers also. I am now a hopeless Schleese addict!